You might be surprised to find out that the life of a video game reviewer isn’t all champagne kisses and caviar dreams. When we aren’t jet setting around the globe in our private jets and swimming in our Scrooge McDuck-sized pools of gold, we occasionally take breaks to, you know, review games. Sometimes we have to endure some real stinkers, and other times we get lucky when true gems come along that remind us brilliantly why we love video games so much. Saints Row: The Third is one such game, a glittering and oh so shiny gem that stands out among the rest — made even more impressive with the sea of games that warrant your attention this holiday season. While Saints Row isn’t genre defining or breaking new ground, it is a clear example of a game done right. Of course it isn’t without its problems, and issues certainly arise in the open and seamless city of Steelport, which while not gamebreaking, do detract from the overall experience. In Saints Row: The Third, The Third Street Saints are now bonafide international celebrities, with everything from their own brand of energy drinks to popular clothing line, with a media empire and success known around the globe. But with mo’ money comes mo’ problems. After an adrenaline-rushed intro mission goes awry, The Saints must relocate and rebuild, shifting the setting from Stilwater to the new city of Steelport. But pimpin that new territory ain’t gonna be easy, as new rival criminal group known as The Syndicate has stolen The Saints money–and that ain’t gonna fly. In Saints Row: The Third, you play as the leader of the Third Street Saints, tasked with wiping out the Steelport’s rival gangs and taking down the Syndicate. The sheer amount of customization afforded you in Saints Row: The Third is quite honestly staggering. I spent the first few hours alone customizing my character, selecting everything from her hair color and weight, to her voice and uh…bust size. And that is just the tip of the iceberg. While the character customization is insanely deep and awesome, it doesn’t stop there. You can customize everything from your vehicle, to your guns; even the gang members in your crew down to what they wear, how they taunt, even what they drive. 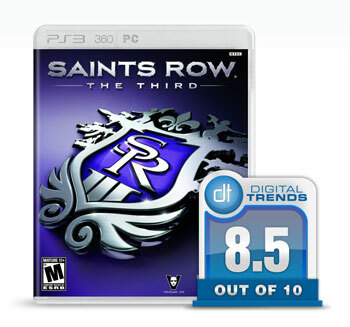 In fact it’s pretty safe to say that no two people will have the same experience with Saints Row: the Third. All that customization and bling doesn’t come cheap, and for you to truly experience what Steelport has to offer you gotta start earning two things: Cash and respect. Cash is earned easily enough–complete missions, assassinate targets and partake in the various side missions and optional activities the game has to offer. Want a break from the story missions? Professor Genki’s Super Ethical Reality Climax show has you participating in a farcical ‘Japanese’ game show funhouse of death, capping bad guys dressed in giant cat-suits or other zany get-ups. If that doesn’t sound like fun then why not try your hand at some insurance fraud? Simply hurl yourself at oncoming traffic and rack up the points. Or my personal favorite, Guardian Angel, where I would deliver some heavenly justice from on high while riding a chopper and laying down some rocket launcher love on rival gang members stupid enough to mess with me and my crew. In addition to cash, respect is the other form of currency in Saints Row: The Third. You unlock respect in essentially the same way as you would cash. As your respect level increases, it opens up the opportunity for you to unlock even more customization options and upgrades like instant reload for weapons, faster health regeneration, the ability to recruit more gang members, and many more. Balancing the respect earned with the cash I made played a big part in Saints: Row The Third. Yeah you might have the respect level to unlock the ability to take zero fall damage or unlimited sprinting, but it costs cash, and if you aren’t smart with your benjamins then you risk making life in Steelport harder for yourself. It might seem like a game design no-brainer, but what I loved about Saints Row was how the game encourages you to play it, to get creative and to overall just have fun with it. I thoroughly enjoyed finding enemy gang operations and busting them up with a smart rocket, or driving around town with my crew looking for trouble. Why take the elevator down to lobby of my high-rise penthouse when I can just jump off the building and parachute below? In the past, criticism has been hurled at the Saints Row series for being nothing more than a glorified Grand Theft Auto clone, but that isn’t a fair assessment at all, any more than saying that a Prius is a clone of a Ferrari. Yeah they share some characteristics and perform similar functions, but while GTA tries to be based satire and offers a more mature and realistic story driven experience; Saints: Row The Third is unabashedly over-the-top and never apologizes for not taking itself too seriously–and to be honest I really admired that. It’s a game and it’s meant to be enjoyed as one, it’s anything but profound, the only thing ‘deep’ about Saints Row is its customization. So if you’re anything like me you may have already darted your little peepers over to the 8.5 score I gave the game and realized that it isn’t a perfect one. Despite all my praise for Saints Row: The Third it certainly isn’t without its faults. The game can be glitchy and issues arise here and there. At times my car would enter a gravity defying spin when traveling over a bump, whirling like a top over and over again against a building, with me thankfully having enough sense to hit the exit button to escape my spinning, flaming box-of-death just before it exploded. Another gripe I had about Saints Row: The Third was just how dead Steelport felt at times. Sure, gangs roamed the city and there was a healthy presence of pedestrians and traffic littering the streets and sidewalks, but it never really felt alive to me. It would have helped with the feeling of immersion to have pedestrians interacting more with one another and their environment, the ability to enter more buildings, and things like rival gangs doing something other than just walking the streets and driving around during open play. Call it a minor annoyance, and perhaps me a sadist, but when running over pedestrians (or anyone for that matter), often they would just bounce off a tad too unrealistically, which took away from the overall enjoyment of my murderous spree of mayhem. That may seem like a minor gripe, but it was part of a bigger issue with the game’s Geo-Mod 2.5 Engine that Volition used. People stuck in walls, texturing problems and things appearing and disappearing were also common. Of course no game, regardless of its features, is worth its salt unless it controls well, and thankfully the Saints don’t disappoint in this department. Controls are simple and intuitive. Driving is a breeze with different cars, bikes, boats, and the air vehicles handled smoothly. The chopper in particular took some getting comfortable with — but in time I was doing my best Airwolf impressions with ease. On foot you’ll fair no different. Targeting was simple and effective, grabbing a human shield was alarmingly fun, and the thrill of base jumping off a skyscraper cannot be overstated. I don’t have the words to describe how awesome it is to bust through a window Dukes of Hazard-style and jack a sweet set of wheels, all with the touch of a button. And while indulging in the odd bit of ultra violence, you will look good doing it. In keeping with its over-the-top style, Saints: Row The Third carries a certain cartoonish quality. The visuals are bright, the clothes, cars, and characters are well detailed, and the city is a sight to behold – especially during the bright-light hours of the night. It might not be bleeding-edge graphically, but it doesn’t need to be. The graphics of Saints: Row The Third is perfectly in keeping with the style and character of the game. Co-op is the new cool kid at the party these days, and Saints Row: The Third allows you to enjoy the campaign mode with a buddy online or via system-link, just like the previous Saints games. The mayhem is multiplied by two and things get crazy pretty quickly but the great part is –- all your progress carries over to your single player game once you’re done with a friend. It is a drop-in/drop-out setup, so the co-op compliments the single player campaign. When you and a friend want to take a break from bringing down the Syndicate and toppling rival gangs, there are even some co-op specific games you can tackle together before you jump back into the main campaign. One of the most talked about is the immediately offensive “Whored Mode,” which has you attacking waves of enemies solo or with a co-op friend. With each new wave you are given new weapons and face new enemies. It is a fun, yet simple, and totally outrageous game mode that will likely be a focus of those offended by Saints Row: The Third, but it is in keeping with the tone of the game. You won’t need the patience of a saint to enjoy Saints Row: The Third. It’s a white-knuckle affair that will keep you smiling throughout its mayhem filled campaign. Hats off to Volition and THQ for creating an open-world experience that is simply entertaining and electrifying. There were so many moments that I felt like a complete badass in Saints Row: The Third. Even after every adrenaline filled injection of madness and mayhem the game kept throwing at me, I wanted more and more, and got just that — I simply couldn’t get enough. While Saints Row: The Third might not be game of the year material, suffering from some minor hiccups and technical issues, it’s definitely a statement of intent and a challenge to those that write it off as a simple Grand Theft Auto clone, forcing gamers and critics to realize that it isn’t GTA and it doesn’t need to be. Saints Row has a personality all its own and it’s a total blast.